Spring is the time of year when the flowers bloom and the weather begins to change, but it is also the time when you renovate and upgrade your property. Spring cleaning can be a great way to remove clutter and also add to the overall curb appeal of your home. You might often concentrate on the interior of your home when it comes to spring cleaning. However, this does not have to be the only choice. 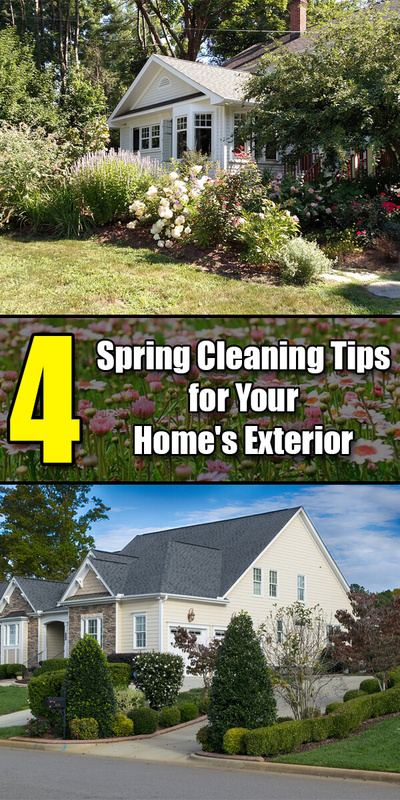 There are plenty of ways that clean the exterior of your home during spring cleaning. You take the time to wash your car, why wouldn’t you make sure that your home is clean? This means that one great spring cleaning duty should be to pressure wash the outside of your home. It is a great way to clean the exterior of your home and leave it looking great. The best part is that by using a pressure washer, you do not have to scrub down the outside of your home. The pressure tool will do all the hard work for you. This is ideal and a great spring cleaning idea for the exterior of your home. And don’t worry, using a pressure washer really isn’t that complicated – check out this guide to get a gist of the basics. No matter what material your driveway is made out of, it is most likely time for an upgrade. Chances are they your driveway is filled with holes and areas that have not held up over time. It can be a great idea during spring cleaning to concentrate on your driveway area and make sure that it is properly maintained. Patching cracks and holes in your driveway will not take a lot of time to repair, but will make a lot of difference in the end. One aspect of home repair that often gets neglected are your window screens . Window screens have a specific purpose in your home, but they can wear and become damaged over time. It is a great spring cleaning idea to take the time to make sure all window screens are clean and in good condition. It might be time to buy a few new window screens and change out the old ones. Having good quality window screens can save you a lot of headaches in the future. If is easy and fast to change your window screens. Spring really is the best time to give it a go. Your roof may be out of sight, but it should not be out of mind. Spring cleaning should motivate you to make your roof a priority. The winter can be especially damaging to a roof. It is a good idea to make sure your roof is still in great condition as the weather begins to change. You want to make sure that there are no vulnerable spots on your roof. This is only done if you take the time to have a company that does roof repair in Ann Arbor utilize their expertise to assess and repair your roof as a spring cleaning task.